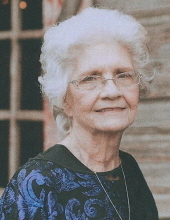 Joyce Maxine McGowen, resident of Ponca City, passed away Tuesday afternoon, March 19, 2019 at her home. She was 86 years old. Joyce McGowen was born on February 13, 1933 in Ponca City, Oklahoma to Ralph N. McEnany and Bessie M. (Shook) McEnany. She graduated from Ponca City High School in 1950. Following high school, Joyce worked for Southwestern Bell Telephone Company from 1952 until she took early retirement in 1979. Joyce enjoyed baking, crocheting, spending time with her children, grandchildren, great grandchildren and most of all, her beloved Shih Tzu, Bently. She is survived by her daughter Tresa (Stieber) Hammond and husband Joe of Edmond, son David Stieber and wife Tammy of Ponca City, son Barry Stieber and wife Lisa of Broken Arrow, grandchildren, Dr. Lindsey Hammond of Tulsa, Laura (Hammond) Vernon and husband Stephen of Edmond, Jason Hammond and wife Rebecca of Piedmont, OK, Dillon Hammond of Edmond, Jaime (Stieber) Orman and husband Michael of Dallas, TX, Paxton Stieber of Broken Arrow, Noah Stieber of Broken Arrow, Griffen Stieber of Broken Arrow, Erin Stieber of Ponca City, and Todd Vidrickson of Ponca City, great-grandchildren, Zoe, Olivia, Emmy and Stella Vernon of Edmond, Nolan Hammond of Piedmont, OK, and Luca and Milo Orman of Dallas, TX. She was preceded in death by her parents, her sister, Lois (McEnany) Evans and husband Don, her brother, Gene McEnany and wife Mary, brother, Bill McEnany and wife Betty Sue, her sister, Reba (McEnany) Swopes and several nieces and nephews. A graveside ceremony for Joyce will be held at 10:00 am on Tuesday, March 26, 2019 at Resthaven Memorial Park with Pastor Mike Sweetman officiating. Casket bearers will be: Jason Hammond, Dillon Hammond, Noah Stieber, Griffin Stieber, Barry Stieber, and Stephen Vernon. In lieu of flowers, memorial contributions be made in Joyce’s honor to the Hospice of North Central Oklahoma, 445 Fairview, Ponca City, OK 74601.